Finally got around to taking some photos of the next dress in the summer of the dress saga. 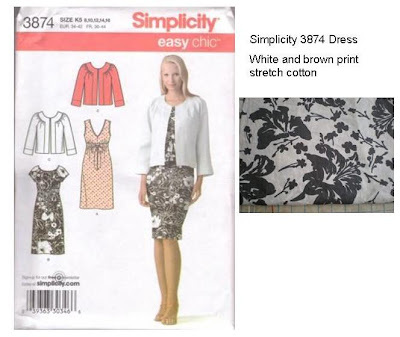 I made Simplicity 3874 which looks like it's now OOP even though it is only a 2007 pattern. I used a stretch cotton that I bought in Bangkok at the beginning of this year for some crazy price like $1 a metre (so I bought 5m, I was a little constrained by luggage weight sadly). I fully underlined it with white cotton poplin, which is equally cheap, throw in an invisible zip and some thread and I have a pretty nice maternity dress for next to nix! Yes I am wearing high heels in the photo, and probably will keep wearing them for a few more weeks yet! So far no problems like stumbling or lower back pain, although I am sensible enough to wear flats to and from the bus stop to office (it is an up hill trek). Can't believe how obsessed I was with what shoes I was going to wear when I first fell pregnant, I shouldn't have worried about it at all. I only have about two months work left before going on a year's maternity leave, so I think my current shoe collection will see me through. A few people have asked in the comments to previous posts how I am managing to sew so quickly. Well it's all in the fitting, or in my case lack of having to do it! I realise now that tweaking patterns, darts, side seams etc to get a nice fit over the bust, waist and hip line is what takes so long during pattern alterations and garment refinement at the end, not the actual sewing of seams. But now that I'm aiming for a loose and easy fit around my waist and hips I'm not spending too much time on that and I'm finding that I can just plow through the sewing in no time. Of course post pregnancy I'll be back to the agonising fitting that takes so long (but is essential to a good outcome) but for now I have a pressing deadline to meet - I need clothes that fit and I need them now! - so I'll keep on with the easy sewing. Saturday here turned out very very hot, and after a bit of garage sale-ing and op shopping I came home to continue my usual fun Saturday of washing and house cleaning whilst the husband was out and not under my feet (I swear it takes twice as long when he's around trying to "help"). Anyway I quickly realised that none of my casual shorts for around the house fit, and whilst I love the 1950s you won't catch me cleaning the toilet in a dress! So I whipped up some shorts out of some dark brown cotton drill that I picked up in the great op shopping trip to Dubbo a few weeks (a very short term resident of the stash indeed). These were so simple it only took about 3 hours to make two pairs of shorts from start to scratch, it's amazing how much time is saved when you're not taking pains to get a good fit around the waist but instead whacking elastic on. 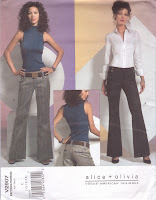 I used an alice+olivia Vogue 2907 pants pattern because it has such a wide yoke that I knew all I had to do was make the waistband from stretch fabric and I'd be sorted. The first pair I left off the welt pockets, but the second pair I made a little nicer so I could wear down the shops etc, and made turn up cuffs, the welt pockets on the back and some tortoiseshell buttons on the front side pockets and the welt pockets just for a little detail. I also raised the back waistline, but forgot to lift the position of the welts so it looks a little strange 'cos they are a bit low, but I can live with it. Now, following all of your good advice about leaving this dress big because I'll soon fill it, I've decided to leave it as it is - I figure you all know much better than I, having been there done that so I'll defer to your good judgement. Thank you all for your comments on this one, they were very helpful in deciding. Plus with the red jacket it sort of pulls it in and makes a bit more streamlined, so I can live with that for the next few weeks before I really balloon out! And the Simplicity dress? Well it's nearly there, I spent Sunday morning sewing it up, my mum helpfully pinned the hem for me since it's getting harder to see past my ginormous belly and now all that is left to do is some hand sewing. I might take it to work with me tomorrow to finish it off, god knows I waste enough time in that place I may as well do something useful LOL! To reassure you all that I don't see always see fashion in shades of grey, I thought I would share with you my planned fabrics and patterns for the summer of the dress challenge. For my work clothes I do tend to sew in neutral colours like grey, black or navy blue because I work in a conservative office environment, I like to wear matching tops and bottoms, and I like to add colour through wearing brightly coloured heels, scarfs and handbags (point in hand - I don't own a black handbag and my coloured shoes far outweigh my black ones). 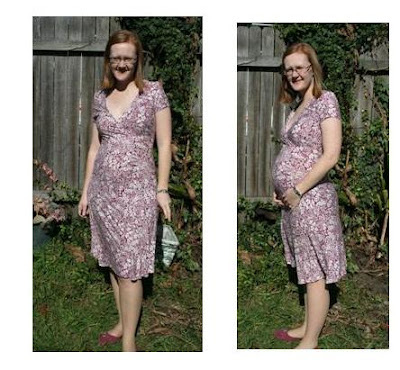 But since I'm pregnant, have 2.5 months left of work for at least another 12 months, I'm trying to make more casual style dresses so I'll be using all the great colours and prints that are sitting in my stash. First up is a simple cotton dress in a white with brown floral print that I already have cut out and will sew up this weekend. I plan to add a little more volume across the front to make it maternity friendly and I already have a white cotton jacket to wear with it, so I guess I'm being a slave to the pattern photo on this one! A 1960s empire line wrap dress, to be made in a linen in a black and beige/yellow print. This should be large enough to wrap around my preggy belly, and also it is a good style for easy access to the 'girls' when I start breastfeeding. 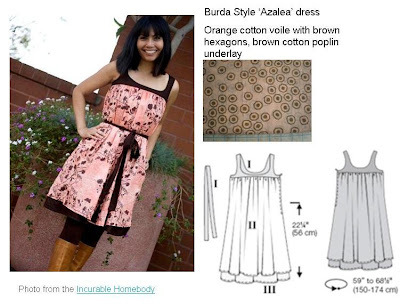 The 'azalea' dress downloaded from Burda Style, as modelled here by the beautiful Maya511 on the Burda Style site and from her blog at the incurable homebody. I have shamelessly copied her colour scheme because a) I love it and b) I happen to have an apricot/orangey cotton voile with small brown hexagon squares in the stash. This will have enough volume for my belly, and I'll make it nursing friendly by making those straps openable with button attachments at the front. 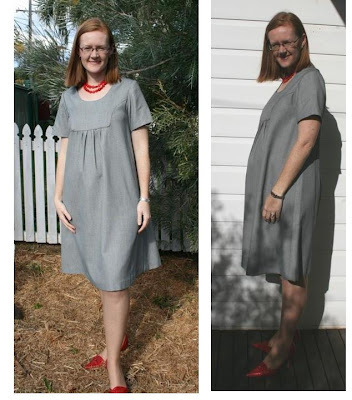 A simple BWOF dress which I will make nursing friendly by making the straps openable, probably with a button closure, and add extra width to the front if those pleats aren't enough to go around my belly. This will be in a vibrant red floral cotton voile, that has a navy blue border print. Another BWOF gem, this one should be low cut and stretchy enough to pull down the top for nursing, and should stretch nicely across my belly. And yet another BWOF (gotta get my money's worth!) with a zippered front which will be ideal for nursing, and I may raise the drawstring section a little higher to sit above my belly and add extra width below that for gathering. To be made in a purple and green leaf print cotton voile. 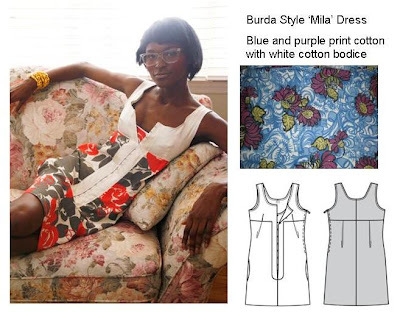 The Mila dress downloaded from Burda Style, to be made in a blue and purple print cotton that I picked up in one of my recent op shopping sprees, with a contrasting centre panel in white similar to the Burda Style creation photo. This one might have to be post birth and return of waistline, or I'll add some pleats to the front under the bust line to accommodate my current extra girth. And last but not least, a modern BWOF that I will make in a modern graphic print cotton that I've had in the stash for a few years after buying it off ebay and then not knowing what to make with it. 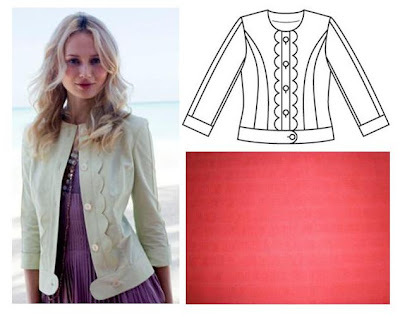 I'll use a bright red cotton for the contrast panels for the pocket, armhole, waistband and central placket. To make it maternity friendly I will continue the pleat that starts below the pocket to the waistband to give extra width across the front. After my belly goes away and my waist comes back (fingers crossed!) I can sew down the pleat and reduce the volume. 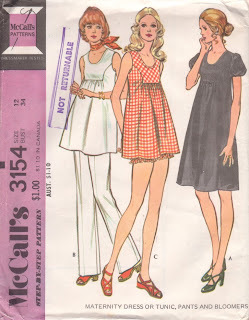 Thanks to Suzy and others for pointing out the need for nursing friendly clothes, I'm now looking at all my patterns in a new light but lucky there are quite a few patterns that fit the bill or are easily adaptable. Alright, I'm calling it quits on the UFOs (unfinished objects for those lucky enough not to have experienced them) because it's just plain and simple draining me. Besides, a new season has rolled in and so it's time for some new creations (and probably a few stuff ups that will lead to more UFOs, but that is another story!). I’m jumping on the ‘summer of the dress’ bandwagon, kicked off by Erin at Dress a Day with International Wear a Dress Day, taken to extreme by Melynda and her summer of lovely dresses over at Country Girl Couture, and now by Livebird her in Oz has picked up the baton and run with it, coming up with some fab creations over at Sew Retro. 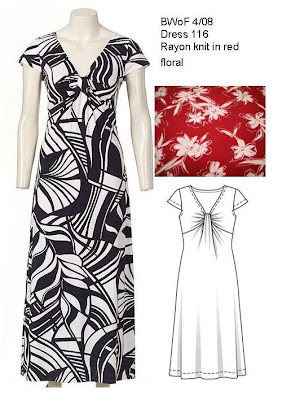 I love all styles of dresses, from fitted shift dresses for work to flowing sun dresses and I certainly have the patterns and fabric to make one for each day of summer if I had the time. But to be realistic, I’m setting a goal of seven dresses – so that I could wear a different one each day for a week if I wanted to. That last rule I set for myself will be the most challenging I think, given that I’m having a baby in the beginning of summer which means that I won’t have my usual body shape and will have to modify patterns accordingly, and with a new born I’m not sure of where I’ll be swanning off to in lovely dresses – I may be the best dressed (or overdressed) new mum down at the baby health clinic, the library or the shopping centre! Ok, so the first cab off the rank is a vintage McCalls 3154 pattern, made in the same black and white check fabric I bought a few years ago from Spotlight and used for the BWOF jacket posted about here. Both fabric and pattern are from the stash so rules no. 1 and 2 met, and I will wear this to work shortly when it warms up a bit, so rule no.3 will be met also. I’m usually wary of using patterns that only have drawings on the front and not a photo of an actual model wearing the garment because you have no way of telling what it will actually turn out like (not that I have a model’s figure and so there is always a degree of this anyway!). This pattern was no exception: it looks fantastic on the pattern drawing, but the dress came out HUGE, and I mean Homer Simpson muu-muu huge that episode when he gained 300 pounds to work from home…. Even my husband asked if this dres was for when I was 'more' pregnant! And now I think I shall call it quits for the evening, I was tracing a BWOF pattern for a friend who is newbie sewist and a BWOF virgin, but I cut my finger so badly earlier this evening it leaked through my bandaid and stained the pattern, and I'm not up to retracing it right now.... Sorry Lisa, I'll get it to you soon I promise! 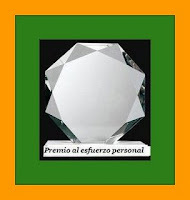 p.s just for you Veronica Darling: BWOF = Burda World of Fashion magazine. Surely it is only a matter of time before you are obsessed with this magazine too! Check out your local borders or big newsagency to have a nosey in one. Man I had a good day today. It's a Friday, and I didn't have to go to work thanks to the marvels of a flex day. It was warm and sunny here in Sydney, and after a sleep in and a leisurely breakfast I took the dog for a walk, had a chat with one of my neighbours and I had a check up with my doctor and everything is going well with the baby. The little monkey has been moving around like crazy lately and I just can't wait to meet him/her, but I know - patience is a virtue and it won't be long before it's here. Yes that is a clothesline full of fabric, bought from op-shopping trips in the last few weeks freshly laundered and now awaiting transformation. Didn't do any of the other washing though, that may have ruined my good mood! And now that I've jumped on-line to see what my favourite bloggers have been up to, I see that the amazingly talented Carolyn from sewingfanaticdiary has bestwowed upon me two blog awards! This is why I feel unbelievably honoured: Carolyn's sewing is impeccable, she puts so much care and effort into her garments which is evident in the professional and polished garments she produces so abudantly - so for her to be not only interested in what I make but also think it cuts the mustard makes me feel, well pretty good actually! 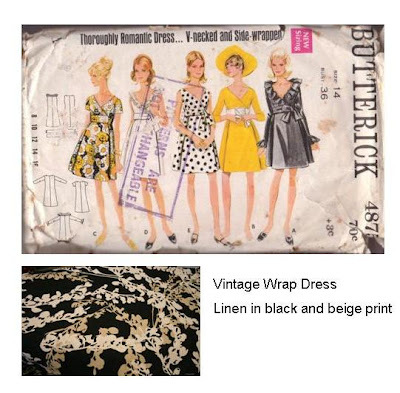 I wanna frock and roll all night - Kitty and Moggy are so funny and make the most gorgeous vintage patterns. Sewing Along Life's Seams - Jean always has something interesting to say on her blog plus she leaves me little stories in her comments all the time! The Big Trade Off - another very funny blog, and Karen makes me feel better by showing that you can have kids and still sew and have a sense of humour. That's Sew Live - Tearsa is a fellow pregnant sewist, is unbelievably glam and has the most show off worthy job, she's on television! Weekend Crafting - Reethi and I are almost at one with BWOF - trying to make more of 'em! 4. Write 6 of your most important values and 6 negative points you condemn. Important values for me and what I look for in the people I choose to spend time with are happiness, gratefulness, generosity, recognition of others, confidence and effort. Negative points I hate in others (and myself when I display them) would be apathy, dishonesty, wastefulness, arrogance, nastiness and constant negativity/whinging. 5. Inform the 6 recipients by leaving a comment on their blog - done, done and done! so I can wear this latest UFO I finished of course! Even though the last few days here in Sydney have been sunny and blue skies, it has still been rather chilly and after I took the photo below of this skirt I raced back inside to put my trackie pants and cosy cardigan back on LOL. The things we do for our blogs hey? You may have noticed that I've made quite a few skirts from Vogue 9615 (ie the skirt from the last post and several before that), because the wide yoke waistband is ideal to make from stretch fabric to accommodate a preggy belly. This skirt however was the very first one I made several years ago now at least, well started to make anyway! It turned out a bit too short for my liking, and because I used the same fabric for the side in seam pockets as the skirt (a heavy stretch cotton drill), it was bulky right at my saddlebag thighs where extra bulk is certainly not needed. So I set it aside whilst I thought of something to do about it. So to make it work now, I pulled it apart and took out the side in seam pockets and removed the centre back zipper. Then I sewed the front and back pieces together, made an extra wide waistband from my trusty stash of cotton elastene in white which gave enough length for the skirt to sit just above the knee right where I want it. But since there still wasn't enough fabric to turn up a hem, I applied some narrow bias tape in a vibrant blue that I had in my stash (thrifted I think) which also gave this plain white skirt a bit of detail. Then I made patch pockets from the in seam pockets I removed, edged them also with the blue bias tape and here you have it, a finished UFO that only took a few hours and a new need to finish it. I also need to make a nice loose and flowy top to wear with this skirt, because this blue knit tank is not a maternity top and is being stretched to its capacity! The shoes however are supremely comfortable, a pair of Nine West blue leather flats (yes flats!) with a moulder rubber base that are almost like wearing slippers and they are quiet - I really hate flats that make the click clack sound that should only come with a killer pair of heels! phew - try saying that phrase a few times quickly! After a few days and nights of continuous and torrential rain, Sunday turned out to be very sunny, somewhat warm and just perfect for some photos for the completed garments that have been piling up in the last week (now to think of some witty blog posts for each!). First up is my youngest / shortest / least lengthy UFO (oh you know what I mean) - I started this at the end of June so only two months gestation for this one. I cut this skirt out from Vogue 9615 (well and truly on it's way to being an all time TNT for me) at the same time as the black check skirt I posted about here, meaning to sew them both one after the other production line style. The black one came together quickly with no problems but for some reason the back waistline of this skirt became absolutely huge, maybe from matching the stripes at the side and not the notches, or it just stretched while I let the bias hang. Either way I let it sit for a while until I figured the best...ahem easiest and quickest.... way to fix it. I do need to give it a thorough press or maybe even a wash because a quick iron didn't get that horizontal crease out of the front of the skirt that you can see near the hem, caused from years of being folded up in my stash. I must remember to get my fabrics out and refold them more often to minimise this. And yes I know this is grey, but there is a fair bit of blue and white in there too! This week I had to travel out to the central west of NSW to lovely Dubbo, home of the really cool Western Plains Zoo which is so big and spaced out that you can either drive or bicycle between the animal exhibits (no cages here, it's a free range zoo) - almost like McDonald's drive thru but for animal viewing. I was there for a few days giving some training and participating in a workshop with staff from our regional offices located all over inland NSW. Whilst rural NSW is not the most exciting of places, I had a good time with everyone and didn't stuff up my training delivery (yay for the brain still holding up its end of the bargain). This will probably be my last trip for work that involves long distance travel, it is a bit tiring and I'm getting on in this pregnancy caper. And best of all there were 4 op shops within walking distance of where I was staying! Sadly I had to hold back on my purchases since I was flying, because I saw the coolest 1920s style cocktail cart for only $15, but I did purchase about 30m (gulp!) of fabric and a big tin of buttons which was a major scoop because finding buttons like that is getting rarer and rarer these days - there must be obsessive collectors like myself cleaning out all the op shops. From left that is a red self stripe cotton seersucker, a blue floral polyester (shudder, but I liked the print), a vivid blue with purple flowers cotton, a graphic orange and blue print wool crepe, some more polyester with another graphic yellow green print, a polyester chiffon with yellow red and yellow spots, a yellow hanky linen and a cream heavy cotton with brown flecks that is actually a curtain but I'm sure can be repurposed into something better. I've been feeling really big lately and my belly button has flattened out, but there were two other pregnant ladies at the workshop who were one and two weeks ahead of me, and they were HUGE so I'll just shut up now and stop whingeing.... Plus I had an antenatal class today with the hospital physio about pelvic floor muscles, looking after the lower back muscles, exercises and stretches to do and not to do etc and the variety in sizes and shapes even though we were all pretty close in weeks gone was just amazing. So another weekend already, isn't time flying by? I was in the shopping centre this afternoon after the physio class and some stores already have christmas decorations up! Anyway this weekend I hope to finish another UFO, photograph the other two I finished last Sunday and Monday although we're in for a wet weekend here in Sydney so I'll have to see. Happy and productive weekend everyone! Op shopping? Check - scored a haul of vintage sewing patterns (including but not only these below), some fabric and some Topkids magazines which seem to be the BWOF for little people. Cake baking? Check - made a yummy chocolate cake for my husband's birthday on Sunday, and even thoughtfully ate most of it to prevent him getting a sympathy pregnancy belly! I even got up earlier than him and make a stack of blueberry pancakes with strawberries for breakfast, now this is UNHEARD of on both accounts because I usually sleep in until after he's walked the dog, bought the newspaper and time my getting out of bed to coincide with the completion of breakfast making! UFO completion? Check, check and check - yes I finished three things off, although I only got to photograph two of them because sunny Saturday turned into gloomy Sunday. Admittedly the two dresses below required minimal work to complete them, but the third was a complete overhaul so it was still a big achievement. These two dresses only needed one seam sewn to finish them, which on the surface seems appalling lazy of me not to have done it sooner. But in my defence the reason they became UFOs is because I didn’t like the way they turned out and I took them apart and tried sewing them in a few different ways before giving up and stuffing them into the UFO pile. I used the infamous New Look 6429 faux wrap dress that everybody, and I mean everybody raves about over on Pattern Review and on their blogs. I made both of these over two years ago, and even wore them once or twice, but was never happy with the gathers across the stomach because it gave a little pouch where there never used to be one. I tried pleats instead of gathers, then I tried a series of horizontal darts, and then I tried taking them out altogether in an effort to get it to sit smoothly across my stomach but it didn’t work. But now I do have quite the pouch happening up front, I put the gathers back in the way the pattern intended, finished sewing the seam, fixed the hem across that seam line and in less than half an hour I have two more maternity dresses. 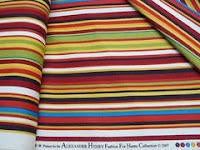 The first one is made from a Missoni like zig zag print that came from Britax fabrics in San Francisco, purchased many many years ago by my husband’s late great aunty who died last year aged 92. She didn’t speak much English, but she was greatly impressed / amused by my childlike recitation of numbers 1 to 10 in Cantonese, and I think she liked me enough to give me some of her fabric! Right, on to answering some comments. It's very observant of you Sally to notice no sewing has been done for the baby, in fact some real life friends quizzed my mum over this too! I have a stack of newborn and small baby sized onesies and singlets and pants that have been given to me already, and plus the baby will be born in summer so it will probably spend the first month or two in a nappy and swaddled in muslin. So I think I will wait until it pops out and I see what it is before making any clothes, but I do intend to make some other things like a nappy stacker, change table mat cover and some nappies and nappy covers once I get my hands on some PUL and other absorbent materials. Vicki, if this baby comes out with red hair and fair skin I'll be very surprised since my husband is Chinese, and I think the black hair is a dominant gene. Although it would be worse if it came out with Asian features and red hair, that's a scary thought! Sue - I answered your question on your blog, but for the benefit of any other Aussies I got my BWOF from the isubscribe.com.au website, and the delightful Europress distributors did a magnificent job in delivery the June issue so quickly (hopefully they keep it up). Jean - my husband is holding up pretty well (I think). I haven't sent him out on any midnight runs to satisfy my weird food cravings, and he's used to me having a nap on the lounge each night when he gets home from work already. He may be feeling cramped in bed though given that I seem to be using more and more pillows and pushing him further and further over! We are attending antenatal classes soon, and a breastfeeding class which specifically requires partners to attend (what for I don't know!). Finally, Pixie I hope you had a great birthday today despite having to bake your own cake. And I bet if you went to work today you had to provide your own cake for morning tea right? That's how it is in the public service here.